This First Look guide introduces you to how InterSystems IRIS™ handles database encryption, which is an important part of any organization’s security strategy. This First Look guide presents an introduction to database encryption and walks you through some initial tasks associated with creating an encrypted database. Once you’ve completed this guide, you will have created a key file, activated the key file, and then used it to encrypt a database. These activities are designed to use only the default settings and features, so that you can acquaint yourself with the fundamentals of the feature without having to deal with details that are off the topic (though these may be important when performing an implementation). For the full documentation on database encryption, see Managed Key Encryption in the InterSystems IRIS Security Administration Guide. While encryption does not prevent all improper or unauthorized use or disclosure of confidential or personal information, ensuring encryption of data at rest provides an important layer in the defense of the security of information. Putting encryption in place at the database level provides an added dimension to your information protection controls. Note that many of these legal requirements focus on data breaches, as they are an increasingly common phenomenon, but the current framework obligates organizations to address risk through proper security controls, such as role-based access, password protections, intrusion detection, data loss prevention, and logging/auditing  as well as encryption. Encryption alone will not address all mandatory requirements, but provides a secure foundation. Encryption at the database level enhances protections by requiring an attacker to not only gain access to the system or file space, but to also have access to the database. This additional layer provides assurances to the organization, its customers, and any stakeholders. For activities associated with database operations, the InterSystems IRIS encryption and decryption processes are transparent to users. From the perspective of the end user or the application developer, the application simply performs its usual activities and the data is automatically encrypted on disk. From the perspective of the system administrator, there are a few simple tasks to ensure that data encryption occurs; after performing these tasks, again, activities occur invisibly. What’s more, these activities use a minimum of processor time, so they are likely to have no visible impact on your applications. Further, because of how our databases are constructed, these activities are highly optimized. Encryption and decryption use the United States Government Advanced Encryption Standard (AES) in Cipher Block Chaining (CBC) mode, often simply known as AES CBC. InterSystems IRIS supports all legal key sizes for AES CBC: 128, 192, and 256bit keys. InterSystems IRIS performs encryption and decryption using the fastest available implementation. Whenever available, encryption and decryption take advantage of the processor-based instruction sets and their inherent efficiencies. Modern Intel and IBM POWER8 processors have such instructions. InterSystems IRIS automatically detects and uses these instructions, so you don’t have take any actions to make it happen. On Intel processors, these are the Advanced Encryption Standard New Instructions (AES-NI); on IBM, they are the AES VMX instruction set. KMIP is an OASIS standard protocol for clients to communicate with key management systems. KMIP servers can be specialized hardware appliances or general-purpose servers running key management software. When database encryption keys are stored in files, InterSystems encrypts the keys using multiple layers of the AES key wrap algorithm, with individual administrator key-encryption keys derived using the PBKDF2 algorithm, thereby making dictionary and brute force attacks impractical. Support for government standards  You can configure InterSystems IRIS to use libraries that are validated to conform to FIPS 1402 Federal Information Processing Standards) for database encryption. This is available on Red Hat Linux. Protecting data in motion  InterSystems IRIS protects data in motion using the newest version of Transport-Layer Security (TLS). TLS, the industry standard protocol for protecting data communications, is the successor of the Secure Sockets Layer (SSL). Support for third-party authorization  InterSystems IRIS supports authorization for using resources on third-party sites, as is frequently seen on the web with logins through Facebook or Google to use a site. This is through the Open Authorization Framework version 2.0 (known as OAuth 2.0) and may include authentication through another layer, known as OpenID Connect. It’s easy to use InterSystems IRIS database encryption. This simple procedure walks you through the basic steps of setting up an encrypted database. Install InterSystems IRIS  If you are an InterSystems customer, you can install and license a development instance of InterSystems IRIS on your local machine or on another on your network; for instructions, see InterSystems IRIS Basics: Installation. Install with Normal security settings. In the Administrator Name, Password, and Confirm Password fields, enter values such as testadmin and password. This is just an example case, so don’t reuse a password that you would use in a development environment. Select the Save button near the top of the page. 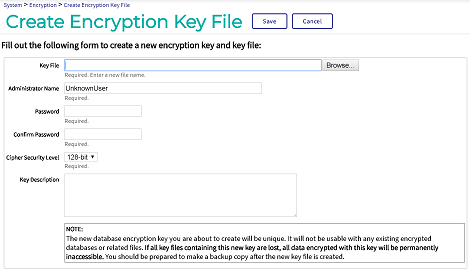 For more details about creating a key file and its initial key, see “Creating a Key File” in the “Managed Key Encryption” chapter of the InterSystems IRIS Security Administration Guide. In the Management Portal, go to the Database Encryption page (System Administration > Encryption > Database Encryption). In the Key File field, enter the location where you stored the key file, such as C:\InterSystems\testkeys.key. In the Administration Name and Password fields, enter the values you specified (testadmin and password). For more details about activating a key, see “Activating a Database Encryption Key from a Key File” in the “Managed Key Encryption” chapter of the InterSystems IRIS Security Administration Guide. Again in the Management Portal, go to the Namespaces page (System Administration > Configuration > System Configuration > Namespaces). On the New Namespace page, enter the name of the encrypted database that you are going to create, such as encdb. 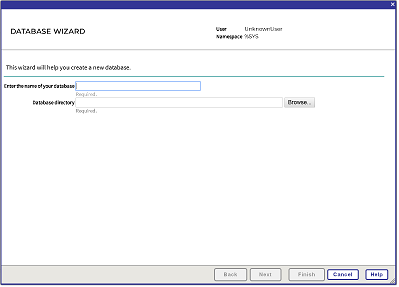 On the first page of the Database Wizard, in the Enter the name of your database field, enter the name of the database you are creating, such as encdb. Enter a directory for the database, such as C:\InterSystems\IRIS\mgr\encdb. On that page, select Next. On the next page, change the value of Encrypt database from No to Yes. On that page, select Finish. 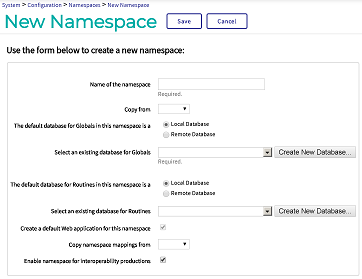 Back on the New Namespace page, in the Select an existing database for Routines drop-down menu, select the database you just created, such as encdb. Select the Save button near the top of the page and then select Close at the end of the resulting log. You have now created an encrypted database called encdb that uses the key that InterSystems IRIS created when you created the key file. You can use this database just as you would use an unencrypted database. Because InterSystems IRIS hides all the machinery for encryption and decryption, you can perform all operations in the usual way and all your data will be encrypted. For more details about creating a namespace and its associated database, see “Create/Modify a Namespace” in the “Configuring InterSystems IRIS” chapter of the InterSystems IRIS System Administration Guide. For background information, see “Namespaces and Databases” in the Orientation Guide for Server-Side Programming. Open Terminal for your InterSystems IRIS instance, as described in InterSystems IRIS Connection Information in InterSystems IRIS Basics: Connecting an IDE. This creates a thousand persistent variables with content such as This is test number 22. Try searching for the string “This is test number” in the file. You won’t find it  because the database is encrypted. In fact, the only unencrypted strings you’ll find are the name of the database or the identifier of its encryption key. Note that the last line of the screen shot contains the values of the variables set in the Terminal. KMIP  InterSystems IRIS allows you to store keys on servers that are separate from those that host your instances. To communicate with such servers, InterSystems IRIS supports the key management interoperability protocol (KMIP). This allows InterSystems IRIS to benefit from the standardized approach to key management that KMIP provides. Changing keys and adding or removing encryption  You can easily change a database’s encryption key. It is also straightforward to encrypt an unencrypted database or make an unencrypted copy of an encrypted database, should either of these actions be necessary. Encryption for related data on disk  InterSystems allows you to easily encrypt its temporary cache databases and other on-disk content that it uses to keep its recent transaction records current (that is, its journal files). Chip-based encryption  Chips are available that perform encryption as part of their activities, which provides much faster speeds for operation. InterSystems IRIS supports the use of such chips. For more details on chip-based encryption, see the next section. Encryption Awareness  InterSystems Online Learning interactive course providing conceptual introduction to our encryption technology. Managed Key Encryption in the InterSystems IRIS Security Administration Guide  InterSystems documentation on database encryption and related features. FIPS 1402 Compliance for Database Encryption  InterSystems documentation on InterSystems IRIS support for the FIPS 1402 standard.